✭✭✭✭✭ We are happy to present you this App celebrating the opening of our small factory of dreams ‘111’ (tresunos.com). ✿— We are a small independent team and we know what good games are made of. We love art, comics, composing music and we’ve grown programming on wonderful inventions such as our dear Spectrum 16 Kb and surrounded by delicious Apples. Now we mix all these ingredients together to make our dreamed game come true with a 100% original work. We adore being so close to you in this nearly magical environment. 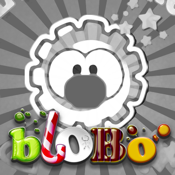 After nearly 11 months of evolution and development, 'Blobo the Explorer Family' has become a game loved by their users, intuitive and universal (it explains itself without introducing any idiom), growing up in constant progress with every new update. We want to get back the sensations of old traditional games while you explore the iOS universe. We do it here, where technology and Humanities are joined together in a fascinating way. Tap on the music boxes with a playful and educational main goal : EXPLORE, coloring and interacting with Blobo family’s world enjoying the sounds, music, colorful and funny animations. Let the Kids play to develop hand-eye coordination, memory and manual dexterity skills with a Big Smile. That Kid’s Smile fills us with infinite satisfaction. Thanks for your download, hope you enjoy so much as our kids and we do it. We find ourselves very fortunate to have met you. This platform gives us this wonderful opportunity. — Spend a few cents in 'Blobo the Explorer Family' to let us keep working hard on our loved projects. — Give us your rating so this App will grow at your side ✭✭✭✭✭. — Contact us through our website and tell us anything you want about our project. We are delighted to receive your proposals directly. — Give us a 'like' on our facebook page to keep track of the evolution, growth, how is done and a lot of curiosities about our team and ‘Blobo the Explorer Family’. Thanks in advance for your contribution and feedback. ✿ " Los juegos para niños tienen más objetivos que el puro entretenimiento. En el caso de Blobo, son la mejora de la memoria, la coordinación manual y la destreza. Con un planteamiento aparentemente sencillo, en el que el objetivo del juego es guiar a Blobo y su familia por las diferentes fases, descubriendo nuevos elementos en cada una de ellas, lo cierto es que esta aplicación esconde un juego realmente educativo y entretenido para los más pequeños, que se verán atraídos por la gran variedad de elementos y su colorido, acompañados en todo momento por una bien diseñada banda sonora. Una buena opción para pasar las horas muertas.